Butter and cocoa pair to make a decadent, fudgy cookie. 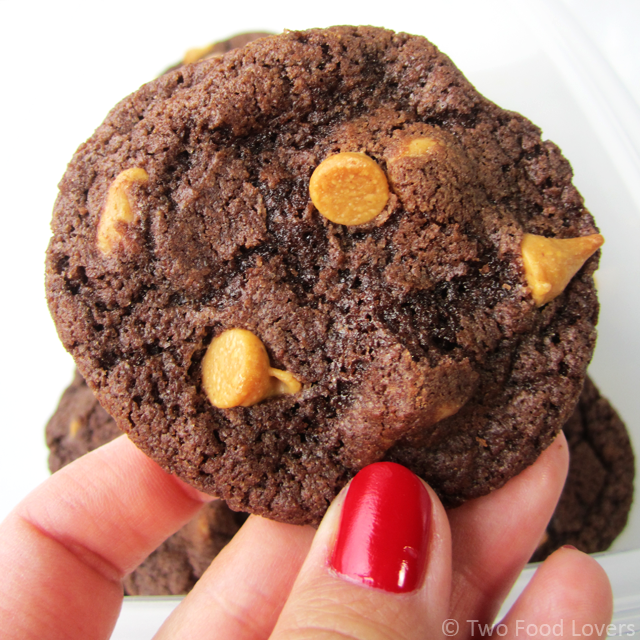 This recipe is easy, and the cookies are an absolute favorite, featuring crispy edges with fudgy centers, and dotted with Reese's peanut butter chips. Yum! These cookies, oh these cookies. 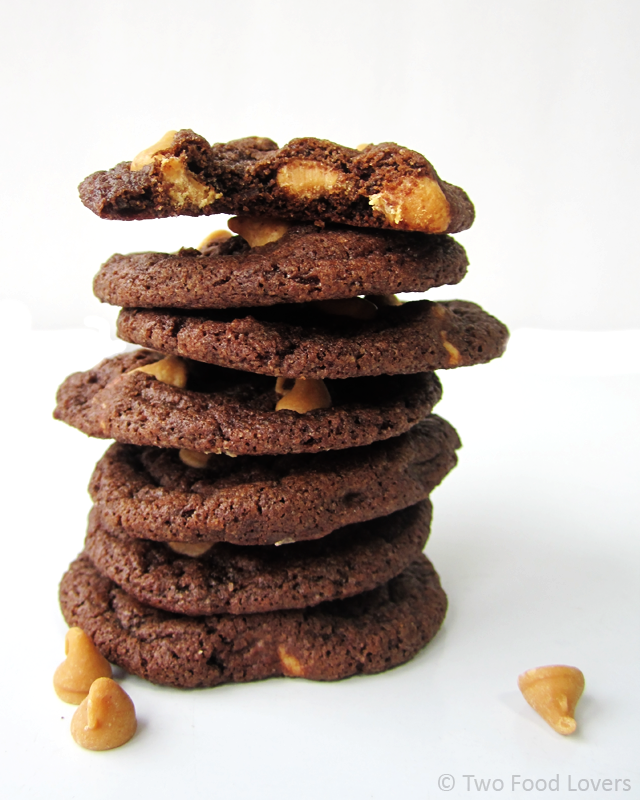 I've made these fudgy cookies a gazillion times, and they always come out delicious. This is my most requested baked good. My neighbors can attest for how wonderfully chocolatey they are and just how often I bake them. I also don't typically eat many of the baked goodies I make. Usually, I have a sample to see how it came out, then force the remainders on my husband. Mean, I know. But seriously, we share a lot of food. We have to. There's no way we could eat everything my kitchen produces. 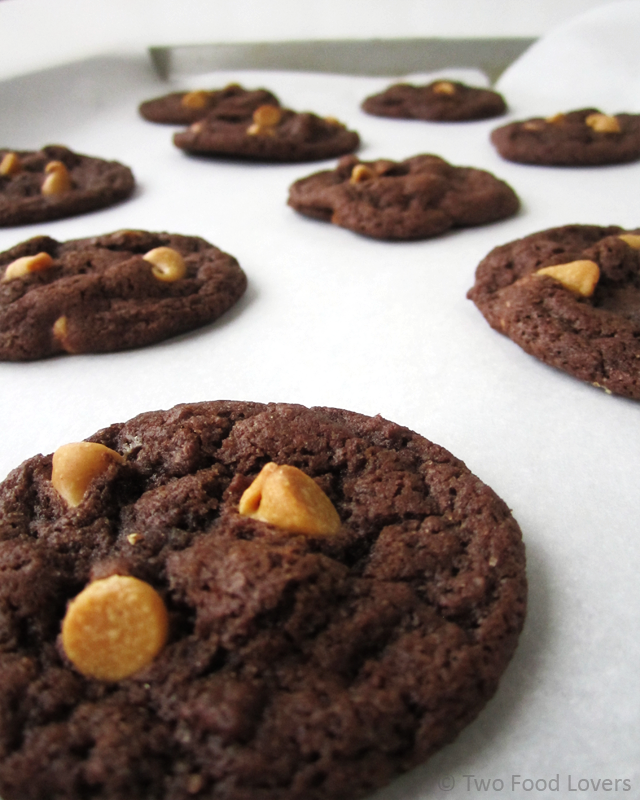 However, these Fudgy Reese's Chip Cookies are my kryptonite. I always have a few straight from the oven. And, since they store well, I always have several more in the following few days. Peanut butter is in fact one of my most favorite foods. I consume an embarrassing amount of PB, to the extent that I almost replace half my meat intake with it. I've always been this way. In high school I carried a jar of peanut butter and a roll of Ritz crackers in my backpack. If I got hungry in class, I'd just whip out my PB. No shame. I know many of you can relate. Whether it's by the spoonful, spread onto a slice of toast, slathered on a piece of fruit, in a dessert, you just stinkin' love peanut butter. Let's start a PB Lovers club. Kay? So, what's better than peanut butter? Peanut butter and chocolate! Reese's are every PB addict's true love, and these cookies are like you just took a Reese's cup, made it more chocolatey and put it into cookie form. This cookie recipe is fairly simple. I've learned a few tricks in my many trials of baking them, and I've called those out in the recipe below. Please do give this one a try. It is SO worth it. The recipe makes a huge batch, so plan to share. Trust me, you don't want these around your house. When we have them on hand, I tend to sneak in and nab one for breakfast, after dinner....ok, fine, I had three after dinner. Step 1: Heat oven to 350° F. Line 2-3 large baking sheets with parchment paper. Sift together the flour, cocoa, baking soda and salt; set aside. Step 3: Cover bowl and refrigerate cookie dough for 30 minutes to 2 hours, optional. Use a cookie scoop to drop rounded balls of cookie dough onto lined sheets. Bake for 8-9 minutes. DO NOT overbake. Your cookies will look slightly dough in the center, but will set as they cool. This is what makes them fudgy. Overbaking will result in a crunchier cookie. Immediately after removing cookies from oven, use the reserved peanut butter chips, press a few chips into the soft tops of each cookie. (Optional, but makes them look prettier.) Cool on pan for 5 minutes; transfer to wire cooling rack to cool completely. *Make sure to use parchment paper or a silcone mat to line your baking sheets. This is a surefire way to prevent sticking. Do no grease your baking sheet. * Refrigerating your cookie dough is optional, but I HIGHLY recommend it. The butter in your dough will start to get warm, and when warm butter bakes in a cookie, the cookie tends to spread. These cookies will puff up and flatten slightly as they bake, but chilled dough helps prevent them from spreading too much. *I bake my cookies for exactly 8 minutes. They will look slightly under-baked in the centers after 8 minutes, but we like our cookies extra fudgy. The cooling time on the baking sheet does help them set up and finish baking. *Your cookie may seem delicate when you transfer it from the cookie sheet to the wire rack, but that's ok. You don't want them to continue to cook on the sheet; transferring them to the rack helps them stay in their fudgy state. © Two Food Lovers. 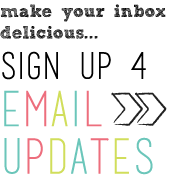 All images & content are copyright protected. Please do not use our images without prior permission. If you want to republish this recipe, please re-write the recipe in your own words, or link back to this post for the recipe. 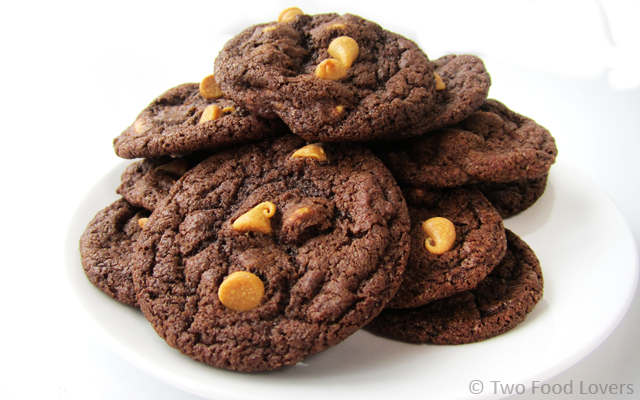 *This recipe originally from Hershey's Reese's Peanut Butter Chips packaging.